I believe that culture and history are both important elements in shaping a city, and I think architecture can bring these two elements together in one piece of design. Cities reflect its local people and translates everyday activity into a piece of art. Walking into the streets and hearing the noise surrounding is like listening to a piece of music. This is a piece of music that reflects its own identity by the unique style of playing on the aod. Its an Iraqi aod playing from the album Resonance/Dissonance. Alsfafer Market in Baghdad the capital of Iraq, it is very much known for its loud noise and how busy and crowded it is.The market is for all kinds of making from iron to steel with all kinds of crafting techniques. When you first walk into this market until you get out of it all you hear is loud noise of hammering blows on copper. 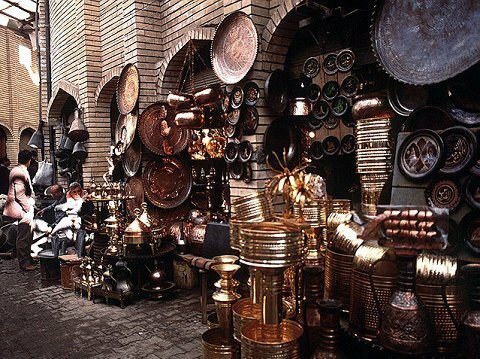 Copper is used of all kinds, yellow, white and red which is the mostly used in the market, making all kind of patterns on pans and kettles as well as accessories for decorating interior spaces.It is one of the very old markets in Baghdad that goes back to the times Abbasid ruling and it was called the ‘Alsfafer’ market for it loud noise from the hammering blows.